British High Commissioner to Pakistan Thomas Drew dropped in to Bani Gala to congratulate Imran Khan on the PTI’s success at the ballot box. 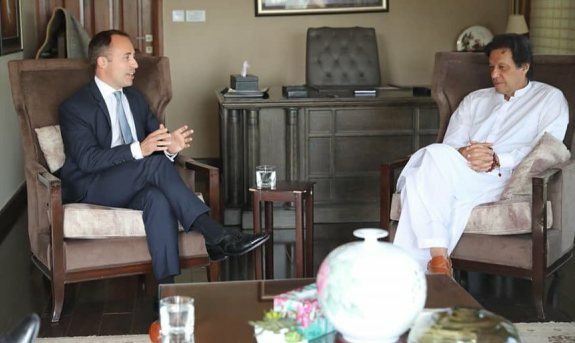 Mr Drew met Imran Khan Wednesday evening and conveyed that his ‘victory’ speech had left a positive impression in the UK and that his government was ready to cooperate with Pakistan. “We look forward to continuing to support Pakistan build the democratic, secure and prosperous future its people deserve,” Mr Drew tweeted. He said the UK government would help Pakistan send 2.2 million children to schools.